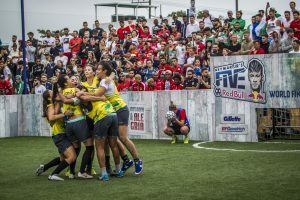 Red Bull Neymar Jr’s Five, the world’s biggest five-a-side tournament, is back for 2019 with the tournament kicking off on in the UK later this month. Open to both male and female teams, 19 UK qualifiers will take place over the course of seven weeks in 12 different locations. Now in its fourth year, the tournament will follow the same unique format dreamt up by the Paris Saint-Germain forward. With games only lasting ten minutes and teams losing a player every time they concede, it’s all about fun, fast paced attacking football. Players must be between the ages of 16-25 to participate, although two players out of the maximum seven per squad can be over 25. After the resounding success of the inaugural women’s competition last year, three more qualifiers have been added to the UK calendar this year. Click here to look for a local qualifier near you. Successful teams from the local qualifiers will go on to compete in the national final in in May, with the winning teams going on to compete in the world finals at the Instituto Projeto Neymar Jr in Praia Grande, an academy set up in Brazil by Neymar Jr himself to help disadvantaged youths in surrounding areas take part in a variety of sports. The road to Brazil and the World Final will see players from more than 40 countries and six continents battle it out for glory in front of Neymar Jr himself, with the winners having the tantalising prospect of taking on the Brazilian superstar and his friends in an exhibition game at the end of the tournament. In what was a first for the competition, 2018 saw the introduction of an all-women’s tournament, with Brazil’s very own Resenha 013 becoming the inaugural women’s world champions. With the tournament’s reputation growing year on year, 2019 is set to be better than ever. To sign up for Red Bull Neymar Jr’s Five go to http://www.neymarjrsfive.com.